Zinc is a versatile metal that has been used for centuries because of its longevity and aesthetic appeal. Are you considering using it for a facade or roof application? 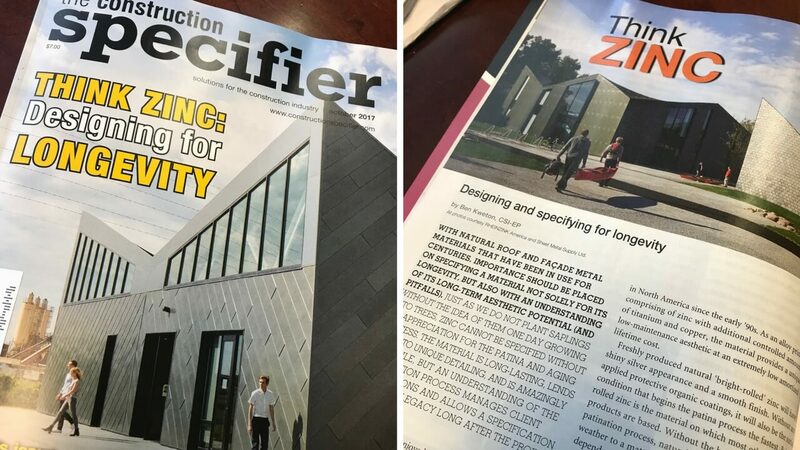 Ben Kweton, CSI-EP, of Sheet Metal Supply, has written an in-depth article on designing with zinc for the October 2017 issue of The Construction Specifier. One of the unique properties of zinc are its weathering characteristics. A combination of zinc hydroxide and zinc carbonate begin to form on the surface shortly after installation. This patination process actually protects the material and increases its longevity. The patinated surface of natural zinc will be matte-gray in color. There are several methods for producing zinc with an aged appearance. These methods are discussed in further detail in the article. The article also discusses the importance of proper detailing, oil-canning, and cleaning and maintenance of zinc applications.